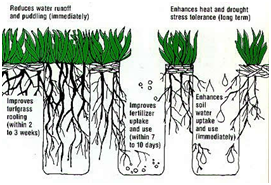 Aeration is the process to either puncture the soil with spikes (spike aeration) or remove approximately 1" x 2" cores of soil from the ground (core aeration) by using mechanical equipment to allow water, oxygen, fertilizers, and other nutrients to penetrate the soil and better reach the roots of your grass. Aeration may be overlooked when trying to restore a lawn but it improves drainage and reduces puddles formation. Aeration provides a good health and strength to the lawn by improving the infiltration of water & nutrients, and creating an environment where grass seed can have direct contact with the soil. The major benefit of aeration is to loosen compacted soils. Loose soil absorbs water much more rapidly than a compact soil. Therefore, this provides the opportunity for the grass root systems to acquire the nutrients, water and air that are essential for growth. Loose soils allow the roots systems to penetrate more deeply into the soil and become stronger and more resilient if they have to fight off the effects of any disease. The best time to aerate your lawn is usually in middle of spring or in the late fall. We would recommend doing it in the spring. This is because aerating your lawn in the spring will prepare it for summer and this is when you will enjoy your lawn the most! After you aerate, over seeding it is also recommended. Lawns that aerated on a regular basis have a better root system and produce better plugs.